[SatNews] Copernicus will create a sustainable European satellite network to collect and evaluate environmental data for civil safety and humanitarian purposes. 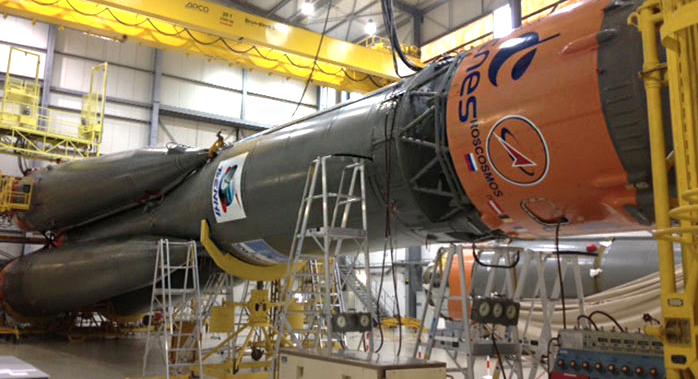 The campaign for Arianespace's medium-lift Soyuz launch with the Sentinel-1A Earth observation satellite is moving into its final preparations for an April 3 liftoff from French Guiana. Flight VS07’s basic three-stage Soyuz launcher is shown in the Spaceport’s MIK assembly building,where it is being prepared for rollout. which has undergone checkout and fueling in the S3B facility. Across the Spaceport in its northwestern sector, the basic three-stage Soyuz vehicle has been built up in the MIK assembly building and is being readied for its rollout to the launch pad where it will be fitted with the "upper composite," composed of Sentinel-1A, the Fregat stage and the protective payload fairing. The April 3 mission, designated Flight VS07 in Arianespace's launcher family numbering system, will be the company's seventh Soyuz fight from French Guiana. It continues the operations of this Russian-built vehicle at the Spaceport, which is in operation alongside the heavyweight Ariane 5 and light-lift Vega launchers. Once in orbit, Sentinel-1A will provide essential data for Copernicus, an Earth observation program of the European Commission in partnership with the European Space Agency. Copernicus will create a sustainable European satellite network to collect and evaluate environmental data for civil safety and humanitarian purposes. Sentinel-1A was developed in an industrial consortium led by Thales Alenia Space as prime contractor, with Airbus Defence and Space responsible for the C-SAR synthetic aperture radar payload. The satellite's environmental tasks to be performed from polar orbit include maritime surveillance and monitoring of sea ice, oil spills, landslides and floods. This data will assist in reconnaissance and operational support activities in response to natural disasters, for which the latest data is required as rapidly as possible. Flight VS07 will be Arianespace's third overall flight conducted from French Guiana in 2014 - following an Ariane 5 mission last week and another in February, which orbited a combined total of four telecommunications satellites. Follow Arianespace's launch activity here.